The Tarrago Shoe Cream Pearly Colors have a iridescent shine to them, a lustrous affect. 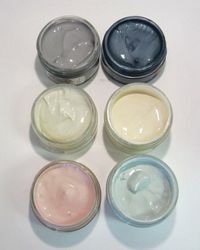 If you like the Pearlescent nail polishes you might like to try some Pearlescent shoe polish for that extra shine. Click picture to enlarge for better view of colors.